Rome had a Kingdom, then a Republic, then an Empire. What follows is the evolving significant people and events which resulted in the Empire. The last Kingdom monarch was Lucius Tarquinius Superbus, located in Ancient Rome. As a result of a political revolution in around 509 BC, the king was expelled from the Kingdom. • 509–508 BC	Lucius Junius Brutus (/ˈluːʃiəs, -ʃəs, ˈdʒuːnjəs ˈbruːtəs/) was the founder of the Roman Republic and traditionally one of the first consuls in 509 BC. He was claimed as an ancestor of the Roman gens Junia, including Decimus Junius Brutus and Marcus Junius Brutus, the most famous of Julius Caesar’s assassins. Joint Consul was Lucius Tarquinius Ar. f. Ar. n. Collatinus was one of the first consuls of the Roman Republic in 509 BC, together with Lucius Junius Brutus. The two men were leaders of the revolution which overthrew the Roman monarchy; ironically Collatinus was forced to resign his office and go into exile as a result of the hatred he had helped engender in the people against the former ruling house. Gaius Octavius (about 100 – 59 BC) was an ancestor to the Roman Emperors of the Julio-Claudian dynasty. He is the father of the Emperor Augustus, step-grandfather of the Emperor Tiberius, great-grandfather of the Emperor Claudius, great-great grandfather of the Emperor Caligula, and great-great-great grandfather of the Emperor Nero. Hailing from Velitrae, he descended from an old, wealthy equestrian branch of the gens Octavia. Despite being from a wealthy family, his family was plebeian (lower class) rather than patrician (aristocracy). It was possible for a plebeian to rise and be accepted by the aristocracy and become a novus homo (“new man”). Gaius Octavius went ‘up the ladder’ in this way although he would not be of a senatorial family. His grandfather, Gaius Octavius, fought as a military tribune in Sicily during the Second Punic War. His father Gaius Octavius was a municipal magistrate who lived to an advanced age. He is a distant relative (possibly as third cousins, through their ancestor Gnaeus Octavius Rufus) to Gnaeus Octavius, the consul of 87 BC who led the opposition to Lucius Cornelius Cinna. Octavius was named in Caesar’s will as his adopted son and heir, then known as Octavianus (Anglicized as Octavian). He, Mark Antony, and Marcus Lepidus formed the Second Triumvirate (the name historians have given to the official political alliance formed on 27 November 43 BC with the enactment of the Lex Titia, the adoption of which is viewed as marking the end of the Roman Republic). The assassination of Julius Caesar on 15 March 44BC (“the ides of March” by the Roman system of dating) is the most famous political murder in history. Caesar had recently been made “dictator for life”, and he was killed in the name of “liberty” by a group of men he counted as friends and colleagues. In the aftermath, the assassins issued coins with a design specially chosen to celebrate the deed and press home the message: it featured the memorable date (“EID MAR”), a pair of daggers and the image of the small hat, “the cap of liberty”, regularly presented to oman slaves when they were granted their freedom. This was liberation on a grander scale, freeing the Roman people from tyranny. The Triumvirate did defeat the assassins of Caesar. Following their victory at the Battle of Philippi, but this caused divisions amongst the Roman Republic and the three fell out and ruled as military dictators. The Triumvirate was eventually torn apart by the competing ambitions of its members. Lepidus was driven into exile and stripped of his position, and Antony committed suicide following his defeat at the Battle of Actium by Octavian in 31 BC. Marcus Vipsanius Agrippa (/əˈɡrɪpə/; 64/62 BC – 12 BC) was a Roman consul, statesman, general and architect. He was a close friend, son-in-law, and lieutenant to Octavian and was responsible for the construction of some of the most notable buildings in the history of Rome and for important military victories, most notably at the Battle of Actium in 31 BC against the forces of Mark Antony and Cleopatra. As a result of these victories Octavian became the first Roman Emperor, adopting the name of Augustus. Agrippa assisted Augustus in making Rome a city of marble and renovating aqueducts to give all Romans, from every social class, access to the highest quality public services. He was responsible for the creation of many baths, porticoes and gardens, as well as the original Pantheon. Agrippa was also father-in-law to the second Emperor Tiberius, maternal grandfather to Caligula, and maternal great-grandfather to Emperor Nero. Many of Rome’s legal and legislative structures (later codified into the Justinian Code, and again into the Napoleonic Code) can still be observed throughout Europe and much of the world. Octavian’s victory enabled him to consolidate his power over Rome and its dominions. He adopted the title of Princeps (“first citizen”) and some years later was awarded the title of Augustus (“revered”) by the Roman Senate. This became the name by which he was known in later times. As Augustus, he retained the trappings of a restored Republican leader, but historians generally view this consolidation of power and the adoption of these honorifics as the end of the Roman Republic and the beginning of the Roman Empire. Augustus died in AD 14 at the age of 75. He probably died from natural causes, although there were unconfirmed rumors that his wife Livia poisoned him. He was succeeded as Emperor by his adopted son (also stepson and former son-in-law) Tiberius. During the reign of Augustus, the King of Judea was Herod (/ˈhɛrəd/; Hebrew: הוֹרְדוֹס‎, Hordos, Greek: Ἡρῴδης, Hērōdēs; 74/73 BCE – 4 BCE), also known as Herod the Great and Herod I. He was a Roman client king of Judea, referred to as the Herodian kingdom. The history of his legacy has polarized opinion, as he is known for his colossal building projects throughout Judea, including his expansion of the Second Temple in Jerusalem (Herod’s Temple), the construction of the port at Caesarea Maritima, the fortress at Masada and Herodium. Vital details of his life are recorded in the works of the 1st century CE Roman–Jewish historian Josephus. Herod also appears in the Christian Gospel of Matthew as the ruler of Judea who orders the Massacre of the Innocents at the time of the birth of Jesus. Despite his successes, including singlehandedly forging a new aristocracy from practically nothing, he still garnered criticism from various historians. His reign polarizes opinion amongst scholars and historians, some viewing his legacy as evidence of success, or a reminder of his tyrannical rule. Upon Herod’s death the Romans divided his kingdom among three of his sons and his sister—Archelaus became ethnarch of the tetrarchy of Judea, Herod Antipas became tetrarch of Galilee and Peraea, Philip became tetrarch of territories north and east of the Jordan, and Salome I was given a toparchy including the cities of Jabneh, Ashdod, and Phasaelis. Tiberius was one of Rome’s greatest generals; his conquest of Pannonia, Dalmatia, Raetia, and temporarily, parts of Germania, laid the foundations for the northern frontier. But he came to be remembered as a dark, reclusive, and sombre ruler who never really desired to be emperor; Pliny the Elder called him tristissimus hominum, “the gloomiest of men.” But this might be explained by the death of Tiberius’ son Drusus Julius Caesar in 23 AD, and Tiberius became more reclusive and aloof. In 26 AD Tiberius removed himself from Rome and left administration largely in the hands of his unscrupulous Praetorian Prefects Lucius Aelius Sejanus and Quintus Naevius Sutorius Macro. Caligula, Tiberius’ grand-nephew and adopted grandson, succeeded Tiberius upon his death. Titus, gained renown as a military commander, serving under his father in Judea during the First Jewish–Roman War. The campaign came to a brief halt with the death of emperor Nero in 68, launching Vespasian’s bid for the imperial power during the Year of the Four Emperors. When Vespasian was declared Emperor on 1 July 69, Titus was left in charge of ending the Jewish rebellion. In 70, he besieged and captured Jerusalem, and destroyed the city and the Second Temple. For this achievement Titus was awarded a triumph: the Arch of Titus commemorates his victory to this day. Titus (Latin: Titus Flāvius Caesar Vespasiānus Augustus;[a] 30 December 39 AD – 13 September 81 AD) was Roman emperor from 79 to 81. A member of the Flavian dynasty, Titus succeeded his father Vespasian upon his death, thus becoming the first Roman Emperor to come to the throne after his own biological father. He responded generously with disaster relief after the eruption of Vesuvius AD 79 which caused the death of at least 16,000 people with suffocating ash and instantly decimated Pompei and Herculeneam. There followed a serious fire and plague in Rome in 80 AD, and again Titus helped fund the relief. The Colliseum was unveiled in that year and in 81 AD Titus died. Hadrian (/ˈheɪdriən/; Latin: Publius Aelius Hadrianus Augustus; was Roman emperor from 117 to 138. He is known for building Hadrian’s Wall, which marked the northern limit of Britannia. 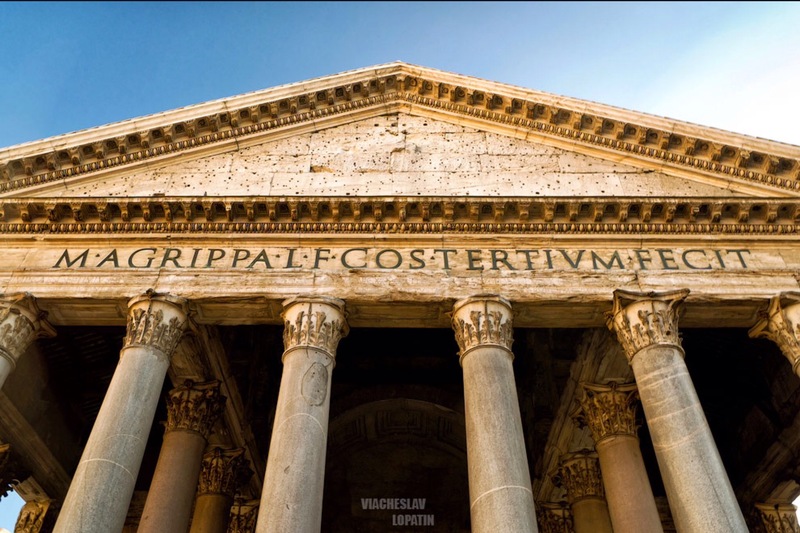 He also rebuilt the Pantheon and constructed the Temple of Venus and Roma. Philhellene (admirer of Greek and everything Greek) in most of his tastes, he is considered by some to have been a humanist. Yet far from Rome, Bethlehem was destroyed by the Emperor Hadrian during the second-century Bar Kokhba revolt (Hebrew: ‫מרד בר כוכבא‬‎; Mered Bar Kokhba) was a rebellion of the Jews of the Roman province of Judea, led by Simon bar Kokhba, against the Roman Empire. Fought circa 132–136 CE, it was the last of three major Jewish–Roman wars, so it is also known as The Third Jewish–Roman War or The Third Jewish Revolt. Some historians also refer to it as the Second Revolt of Judea, not counting the Kitos War (115–117 CE), which had only marginally been fought in Judea). Hadrian’s influence reached out to Brittania when, in 122AD Hadrian ordered a wall to be built from the east coast where the Solway reaches the Irish Sea, across to the west to the North Tyne and the North Sea. It took 14 years to build and had forts positioned along its length, to keep out the tribes of North Ancient Britons away from lands conquered south of it. 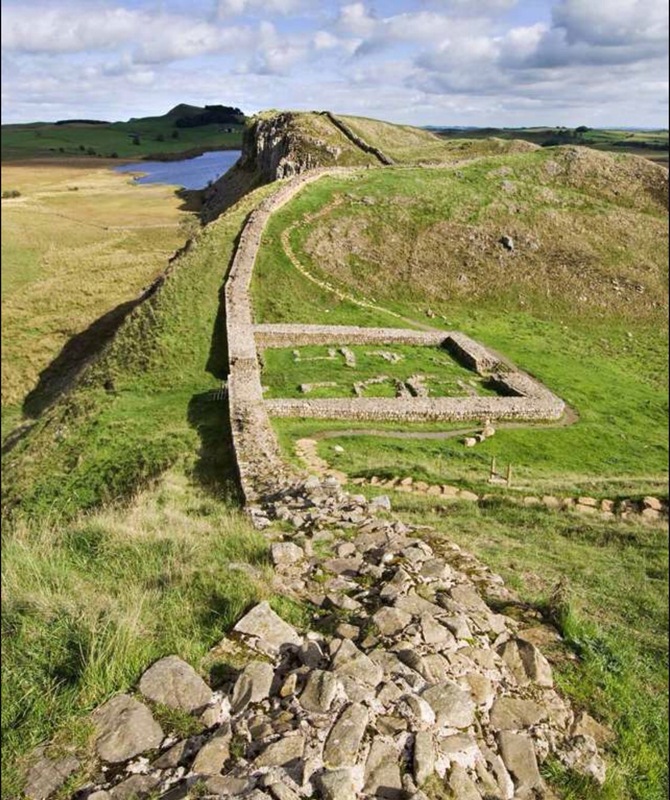 It is called Hadrian’s Wall, the Roman Wall, Picts’ Wall, or Vallum Hadriani in Latin. A number of Assyrians were conscripted into the Roman Army, and inscriptions in Aramaic made by soldiers have been discovered in Northern England dating from the second century. Photo of Hadrian’s wall today (a short distance from where I live). The New Testament reported Bethlehem to be the place of birth of Jesus. Pilgrims identified the location as a cave after the destruction of Bethlehem. It took another two centuries before the rebuilding of Bethlehem, promoted by Empress Helena, mother of Constantine the Great. It was she who commissioned the building of its great Church of the Nativity in 327 CE, it was traditionally considered to be located over the cave that marks the birthplace of Jesus. The Church of the Nativity site’s original basilica was completed in 339. It was destroyed by fire during the Samaritan Revolts in the 6th century. The Samaritan revolts were a series of insurrections during the 5th and 6th centuries in Palaestina Prima province,(Palæstina Prima or Palaestina I was a Byzantine province from 390, until the 7th century. It was lost to the Sassanid Empire in 614, but was re-annexed in 628, before its final loss during the Muslim conquest of Syria in 636. launched by the Samaritans against the Byzantine Empire). The Samaritan revolts were marked by great violence on both sides, and their brutal suppression at the hands of the Byzantines and their Ghassanid allies severely reduced the Samaritan population. The events irreversibly shifted the demographics of the region, making the Christians the only dominant group in the Palaestina Prima province for many decades onward. Due to its cultural and geographical history, the site holds a prominent religious significance to those of the Christian faith. This entry was posted in Uncategorized and tagged Agrippa, Augustus, Byzantine, Caesar, Church of the Nativity, conflict, death, Jesus, Jews, Judea, muslim, Octavian, Pantheon, power, Rome, scotland, war. Bookmark the permalink.